Present state: A house called 'Station House' still stands on the site of the main station buildings. Although it appears to be completely new building, it does incorporate the old station building. A company called International Resource Systems is run from the house. There is no evidence of the platforms other than a line along the length of a brick wall that indicates the position of the demolished up platform. Notes: The exact opening date of Pickhill station is unknown but it first appeared in the company timetable in March 1875 with trains only stopping on Wednesdays and Thursdays with trains stopping by request only. By 1922 trains could also be requested to stop on Fridays with one train available daily for passengers going beyond Harrogate or Northallerton. A full stopping service was introduced in May 1924. Initially the station had one low platform, with a second platform being added when the line was doubled in 1901. The building was an incorporated station house and booking office. There were no goods facilities or water provision but there was a Pickhill siding to the north serving the gravel quarry 1/4 mile to the north of the station and crossover set of points, the points being operated from the signal cabin to the south end of the station beyond the level crossing on the up side. A ground frame release operated the siding replacing the small signal cabin, which operated the siding point and protective signals. The points and signals being operational by Annets key kept in the signal cabin. A timber waiting shelter on the north bound side was provided from opening but there was nothing on the south bound platform. After the station closed to passenger traffic Pickhill siding remained in use until 11th November 1963. In 1835 George Hudson was elected to York City Council (becoming Lord Mayor in 1837). In the same year, he met George Stephenson by chance in Whitby and they became friends and business associates. He learnt of Stephenson's dream of a railway from London, using a junction of the London and Birmingham Railway at Rugby, through Derby and Leeds to Newcastle - but bypassing York! committee to promote a line to be known as the York and North Midland Railway which was incorporated in 1836. This proposed line would join the North Midland at Normanton a few miles east of Leeds and it received its Act of Parliament in 1837. The first section of the Y & NMR opened on 20 May 1839 between York and a junction with the Selby line at Gascoigne Wood with the remaining section to Normanton opening on 1st July 1840. A spur to Methley Junction giving access to Leeds via a working arrangement with the North Midland was opened on 27th July 1840 followed by a southbound curve from the L & S at Gascoigne Wood. The L & S offered a direct route into Leeds from the east while Hudson's longer route into Leeds ran through Castleford via the Whitford and Methley Junctions. On 9th November 1840 George Hudson arranged to lease of the Leeds and Selby and he promptly closed the line to passengers west of Milford; despite his line being 4 miles longer, passengers now had no choice but to use it. In 1844 an act of Parliament was passed allowing the York and North Midland to absorb the Leeds and Selby Railway. Having completed the York line, George Hudson turned his attention to Harrogate, proposing a branch to the town via Wetherby from a junction with the Y & NM at Normanton. Local people and businesses initially opposed the railway fearing an influx of people from Leeds and Bradford would lower the tone of the area but this opposition was overcome and the line opened to a temporary terminus at Spofforth and was extended into a terminus at Harrogate Brunswick on 20th July 1848. Thirsk and Northallerton were early additions to the railway map as part of the Great North of England Railway which, as planned, would run from York to Darlington and then on to Newcastle-upon-Tyne. The middle section between Croft and Darlington was authorised by Parliament on 4th July 1836 and work started near Croft on 25th November 1837. The southern section of the line was authorised on 30th June 1837 and then work was concentrated on this section in order to join up with the Y & NMR which was already under construction with the two companies sharing a joint station at York. Newcastle-upon-Tyne. With George Stephenson he planned and carried out the extension of the line to Newcastle, and by 1844 he had control of over a thousand miles of railway. The GN of ER was purchased by Newcastle and Darlington Junction Railway under act of 27th July 1846 becoming the York & Newcastle Railway and, in 1847, the York Newcastle & Berwick Railway. The Leeds & Thirsk Railway was incorporated by Act on 21st July 1845 to serve Harrogate and to provide an alternative route from Leeds to the north east to break George Hudson's monopoly on rail transport in that area. Although the line was built in 4 years, it was opened in stages as the southern section of the line was more demanding of the engineer’s skills with 5 major viaducts and Bramhope tunnel (which when finished was only exceeded in length by Standedge and Woodhead). The first section of line to open was between a new terminus at Thirsk and Ripon. Initially this opened to mineral traffic only on 5th January 1848 and after the line had passed its Board of Trade inspection a passenger service was introduced on 1st June 1848 although it is likely some passengers had been carried before this date. Railway companies were not averse to taking members of the public along parts of their lines as they were being built as long as the company had stock and locomotives to so do. Such clandestine operations were quite common. 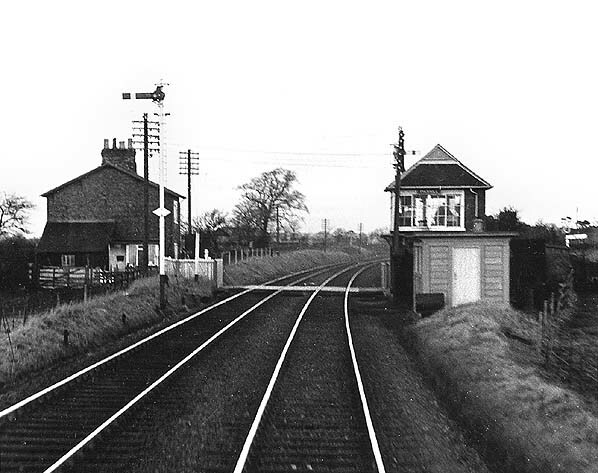 Intermediate stations were opened with the line at Wath (later renamed Melmerby), Baldersby and Topcliffe. At Thirsk the line passed over the YN & B to a terminus close to the centre of the town with the YN & B station being over a mile to the west of the town. The next section to open completely was that from Ripon to Weeton via Starbeck. This opened on 1st September 1848 with intermediate stations at Wormald Green, Nidd Bridge and Harrogate (renamed Starbeck in August 1857). The final section between Weeton and Three Bridges Junction at Leeds (which included Bramhope tunnel and two of the viaducts) opened on 9th July 1849 linking up with the existing line into Leeds Central station which it shared with Leeds Dewsbury & Manchester Railway, The Great Northern Railway and the Manchester & Leeds Railway. Under the NER's Harrogate Branches Act of 8th August 1859 all of Harrogate’s services were brought together in one centrally sited station with the construction of 4 connecting lines, including a curve from Dragon Junction east of the new Harrogate station to Bilton Road Junction on the T & L and from Dragon Junction to Starbeck. Harrogate Brunswick was closed when the new through station was opened on 1st August 1862. The architecture for the Leeds and Thirsk is attributed to Thomas Grainger but with considerable involvement by John Bourne. The latter became resident engineer of the L & T in 1846 and sole engineer in 1852 when Grainger died in an accident on the line. 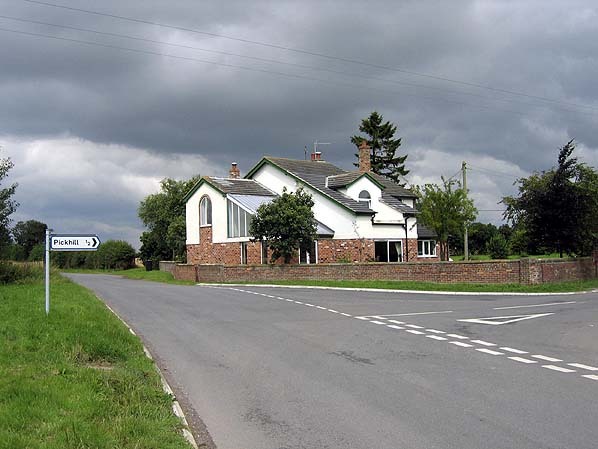 The stations on the L & T were nothing of merit, only three of them were permanent structures at its opening namely Thirsk, Topcliffe and Starbeck. The seven others were nothing short of basic with low platforms and simple timber shelters. In 1846 the L & T sought powers to extend their rails northward from a junction at Melmerby, passing under the Great North of England Railway at Northallerton and then on to Stockton-On-Tees to link up with the Stockton and Hartlepool Railway. This was opposed by the GN of ER who persuaded the L & T to only apply for the northern section of their line from Northallerton in return for an agreement to build junctions at Thirsk and Northallerton which would allow through running between the two lines. The first scheme for a station near the small market town of Masham in Wensleydale, was proposed by the Northern Counties Union Railway for a 127 mile line from the Leeds & Thirsk Railway at Melmerby to Leyburn, Hawes, Kirkby Stephen and Appleby and on to a junction with the Lancaster & Carlisle Railway south of Clifton At Kirkby Stephen, there would be a junction with the Stainmore line running between Bishop Auckland and Tebay. Although the company received its Act on 27th July 1846, the scheme was doomed to failure owing to unworkable clauses being inserted into the Bill at the instigation of the London & North Western Railway and Lancaster & Carlisle Railway who did not want the line to be built, and also opposition from the Duke of Cleveland who was reluctant to sell the company a vital strip of land. Despite this opposition, a total of 2 ¼ miles was completed, including a section of earthworks north of Melmerby. In 1848 the L & T made a further attempt to extend their line northwards from Melmerby to Northallerton and this time they were successful in receiving parliamentary approval. The partially completed earthworks to the north of Melmerby were purchased from the Northern Counties Union Railway formed part of the new route. B with a low level station being built at Northallerton adjacent to the existing station. The section north of Northallerton was to be the most expensive endeavour but is beyond the scope of this brief history. The line from Melmerby to Northallerton was initially single track, and was not doubled until 1901. The bulk of the passenger services were to continue along the original L & T R to Thirsk Junction (as the YN & Bs station at Thirsk was now known) where it took the YN & B route to Northallerton from where it branched off to the east for Stockton. Such a service even continued beyond the doubling of the line in 1901 but gradually passenger trains took the shorter route to reach Teesside and in later years this route increased in importance and was used by the Newcastle - Liverpool dining car trains and the LNER and BR Pullman trains. With trains now running onto the YN & B and on to Northallerton, Thirsk Town station closed in December 1855 although it was retained as the town's goods station until 3rd October 1966. Melmerby station was given an extra platform to the north of the road level crossing forming a ‘V’ with the platform on the Thirsk line. 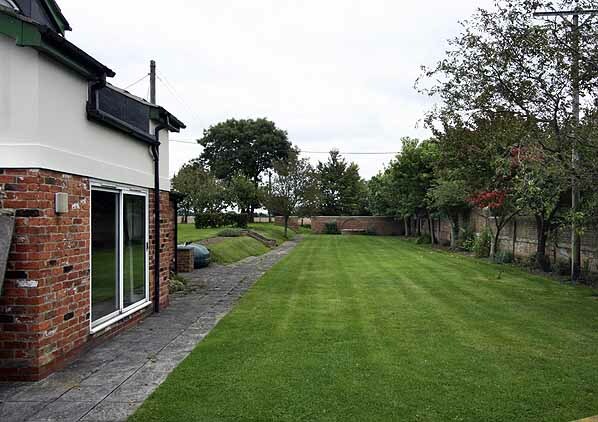 The extension opened on 2nd June 1852 between Melmerby (renamed from Wath) and Northallerton Town which was on the east side of the YN & B. Intermediate stations were provided at Newby Wiske and Sinderby (and further stations between Northallerton and Stockton). Northallerton Low Level opened in December 1854 and an additional station at Pickhill was added in March 1875. On 1st January 1856 a spur was opened allowing services to run from the Stockton line onto the YN & B where they called at the main (high level) Northallerton station. 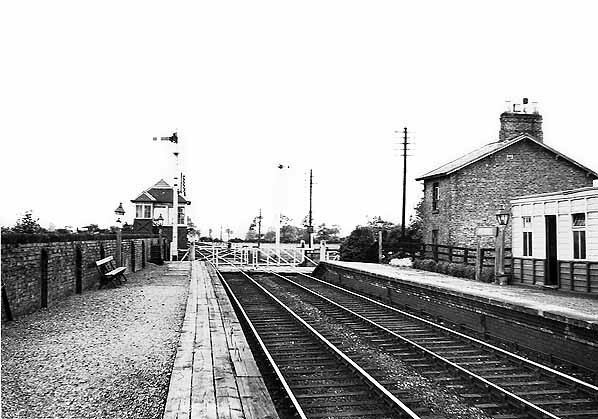 At this time Northallerton Town was closed but the low level station was retained as the northern terminus for local services to Melmerby. When the Leeds and Thirsk first opened the Great North of England Railway was not too concerted so long as traffic from the south of England was routed via their line to the north. However once the Leeds Northern had a connection with the London & North Western Railway at Leeds and access to the docks at Hartlepool via the Stockton line it was clear that the two lines would be competing for traffic. Initially the YN & B slashed fares but it was soon clear that amalgamation seemed the best option. This followed on 31st July 1854 when the Leeds Northern, York & North Midland and the York Newcastle & Berwick amalgamated to form the North Eastern Railway, the fourth largest of the pre-1922 grouping companies. Northallerton Low Level station finally closed on 10th February 1901 when a new link, the Cordio Loop from Cordio Junction on the Leeds Northern to South Junction on the old YN & B, was opened on 10th February 2001 to allow trains from the Sinderby line to run into the main station. A second, the Longlands Loop running from Longlands Junction on the YN & B, under the Cordio Loop to Boroughbridge Road Junction on the Leeds Northern opened for down (northbound) traffic only on the same day. In July 1922, Bradshaw's Railway Guide shows 14 down trains and 13 up trains calling at Ripon, the principal station on the line on weekdays with three on a Sunday. These didn't however stop at all stations however. Baldersby had 3 down trains and 5 up trains with two on Sunday. Sinderby had 3 up trains and three down trains with no Sunday service. During WW2 the War Office considered Northallerton with its strategically important junctions between the former Leeds Northern (although part of the NER since 1854 the line was often still referred to as the ‘Leeds Northern’ until closure) and the main line to be a 'vulnerable point'. If one of the underline bridges was destroyed during an air attack it could block all north - south traffic through the town. To safeguard against this, an emergency connection between the two lines was authorised on 28th November 1940. Construction of the 'Avoiding Line' as it was known started in January 1941. The line was 960 yards in length running from a point just north of Romanby Gates level crossing on the Leeds Northern passing under the Hawes branch on a very low temporary bridge with a headroom of only 4'6" (this would have been quickly demolished if the avoiding line had to be used) to a junction with the main line at Castle Mills. The new line was available for use from 23rd June 1941 but it was never used. 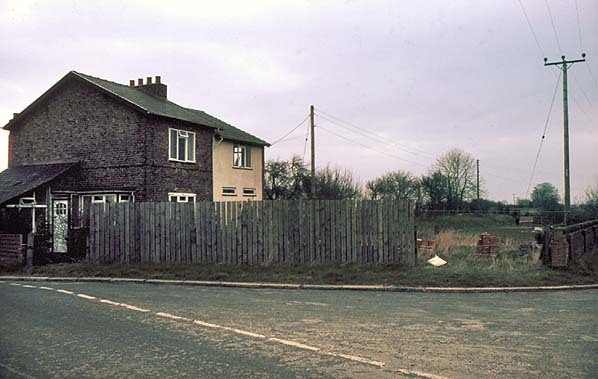 At the same time, emergency platforms were built immediately south of Romanby Gates level crossing, these would have been used if Northallerton station was damaged during an air attack. 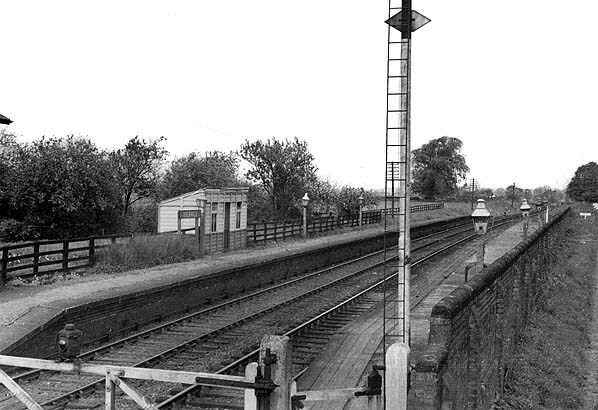 The avoiding line was lifted by the end of 1947 but the emergency platforms remained at least until the 1960s for use by trains bound for Teesside during engineering works on the East Coast main line. The old Leeds Northern survived nationalisation with the exception of Newby Wiske station which was closed as an economy measure in both wars, finally closing on 11th September 1939. After WW2 both passenger and freight traffic was in decline and Bradshaw's October 1951 Railway Guide shows 13 down trains and 11 up trains calling at Ripon with 5 on Sundays. Baldersby had 3 down trains and 4 up trains with 2 on Sunday while Sinderby had 2 down trains and 1 up train with no Sunday service. By 1956 Pickhill was served by only two daily trains, one in the morning and one in the evening, but they were both southbound and would have been of no use to regular commuters. It was soon clear that the service could not be maintained. Pickhill, Baldersby and Topcliffe closed on 14th September 1959 and the line from Melmerby to Thirsk closed completely was lifted. Nidd Bridge Wormald Green and Sinderby closed on 18th June 1962 but all remained open for goods traffic, Sinderby until November 1963 and the other two until August 1964. This left a reduced service between Harrogate and Northallerton calling at Ripon and Melmerby. This was finally withdrawn on 6th March 1967 as part of the Beeching cuts when Melmerby closed completely. At closure, Ripon station was still quite busy with 19 daily departures and 6 on Sundays. The story has a twist in that shortly after closure; a serious accident took place just south of Thirsk on 31st July 1967. This closed all but the up slow line on the ECML and the resulting chaos can easily be imagined. The situation was made no better when attempts to operate the slow line as a dual direction line under a pilot proved to be chaotic. A radical solution was to reopen the Leeds Northern route from Harrogate to Northallerton for north bound trains only, (South bound trains continued on the slow line). As signal boxes had been shut and battery boxes removed, no interlock detectors could be operated, the first priority was to replace batteries. On the same day as the accident, a train had been sent from Darlington with the required batteries and pilot man and all 9 signal boxes and cabins were re-instated. Men were found to operate them on 12 hour shifts until the emergency was removed on 2nd August. Today the southern section of the old Leeds Northern between Leeds and Harrogate is still open, although it now follows a former branch line to York instead of continuing through Ripon to Northallerton. In recent years a feasibility study has been undertaken into the possibilities of reopening the line between Harrogate and Northallerton. There has been a large amount of public support for the scheme. The northern section of the Leeds Northern between Northallerton and Stockton also remains open although all intermediate stations have closed with the exception of Yarm and Eaglescliffe. 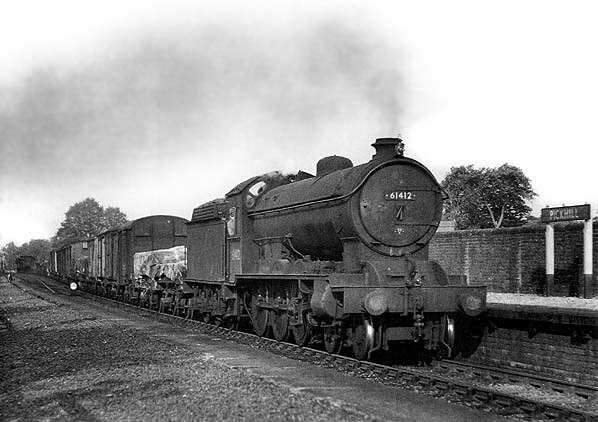 A Class B6 hauls a southbound mixed goods train through Pickhill station in 1954. Pickhill station looking north from the signal box in 1959. Site of Pickhill station seen from the can on a northbound DMU in March 1967. All trace of the station platforms have been removed. The site of Pickhill station looking north in September 2009. The wall on the right was at the back of the up platform and it is still possible to see a band of a different colour which indicates where the platform was.